Can a Water Heater Flood My Home or Garage? Home / Lakewood Ranch Plumber / Can a Water Heater Flood My Home or Garage? Can a water heater leak enough water to flood your home or a garage? Absolutely. Anyone who has had a water heater actually burst at the seams will certainly testify to this. 1) Check the pipes on top of your water heater and look for signs of corrosion or rust. 2) Inspect the tank for signs of rust. 3) Try to determine the date of the water heater. If it is over eight years old, you are probably out of warranty and need to consider a new water heater for your own peace of mind. 4) Trying to get a few more years out of your water heater is like trying to get more miles out of bald tires on your car. 5) Look for signs of moisture around the bottom of your water heater and on the floor. These simple steps may prevent the flood that you don’t want. Also, if your water heater is not sitting in a safety pan, and it is on your living level,you should have one installed. The Florida State Plumbing Code requires this under section 504.7. The safety pan with a drain to the outside is just a good idea. While most water heaters will just leak enough in the pan and drain to prevent damage, there are the water heaters that decide to just let loose and will flood no matter what preventive measures you have taken. 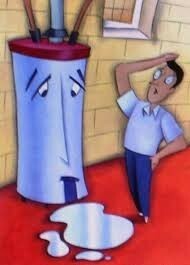 This is why you should take the time to inspect your water heater from time to time. Although you can’t actually see the tank itself, just the outer shell, the warning signs you find, may just save you a big headache and a lot of mopping. We service Sarasota, Bradenton and surrounding areas.